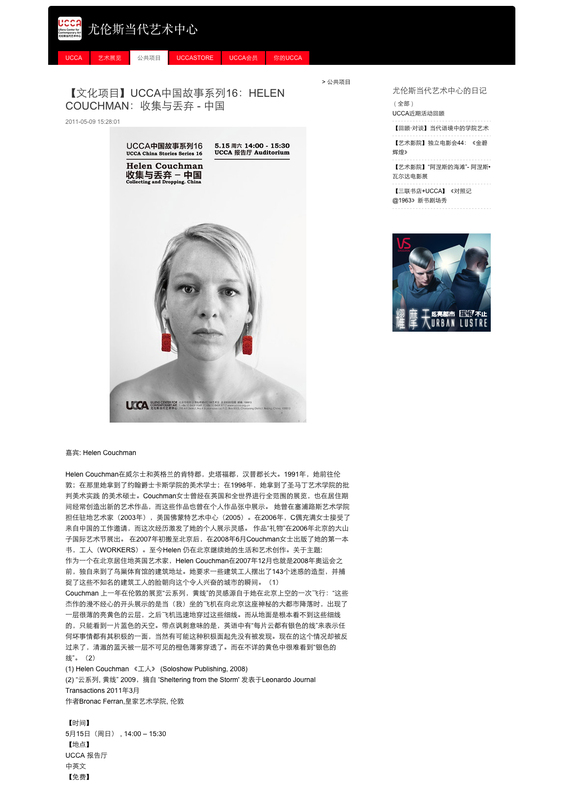 UCCA flyer/poster, Self portrait with long life earrings. 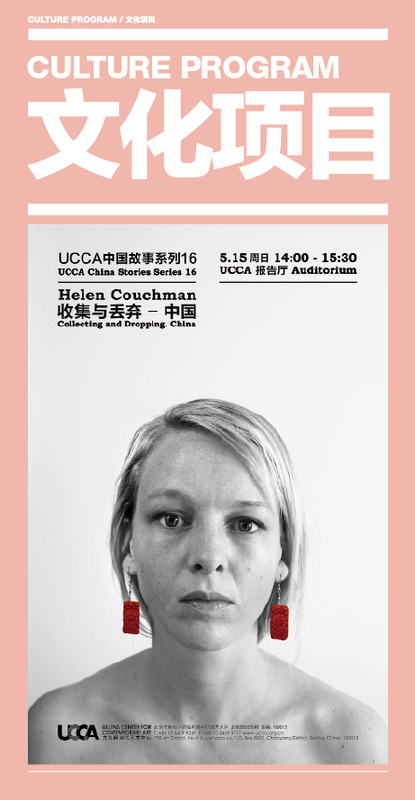 China Stories with artist Helen Couchman: Collecting & Dropping. China. 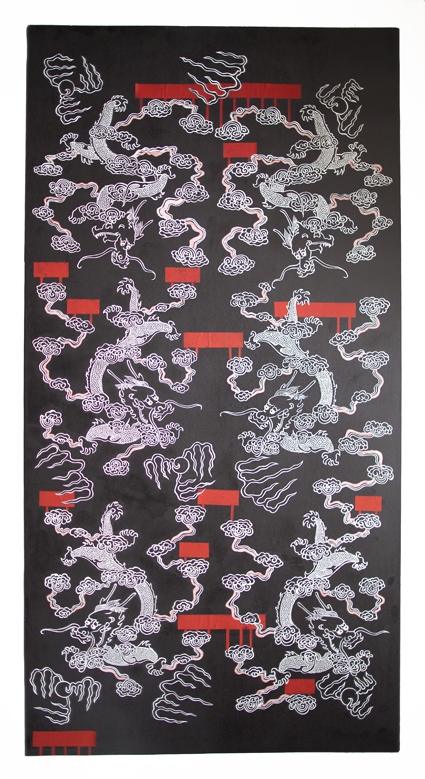 2pm Sunday 15th May at UCCA, Ullens Center for Contemporary Art, 798 Art District, Beijing. Helen Couchman in Wales and England, Kent, Staffordshire, Hampshire grow up. In 1991, she went to London; where she got a bachelor’s Sir John Cass School of Fine Arts; in 1998, she got a Master of Fine Arts St. Martin’s critique of art practice the Art Institute.Often created during Ms. Couchman in the UK and around the world we have full range of exhibitions, but also to live a new work of art, and these works also show the individual works Zhang. She has served as artist in residence (2003) at the Cyprus College of Art, Vermont Art Center (2005). In 2006, C even accepted the job offer full lady from China, but the experience inspired her personal showcase inspiration. Works “gift” in 2006 Beijing Dashanzi International Art Festival on display. After the beginning of 2007 moved to Beijing in June 2008, Ms. Couchman published her first book, the workers (WORKERS). Helen has still Beijing to continue her life and artistic creation. Two etchings from Cloud series, Yellow lining, two woodblock prints (from the New work, Dragon panel series) and one photograph on aluminum, Boy with Firework. 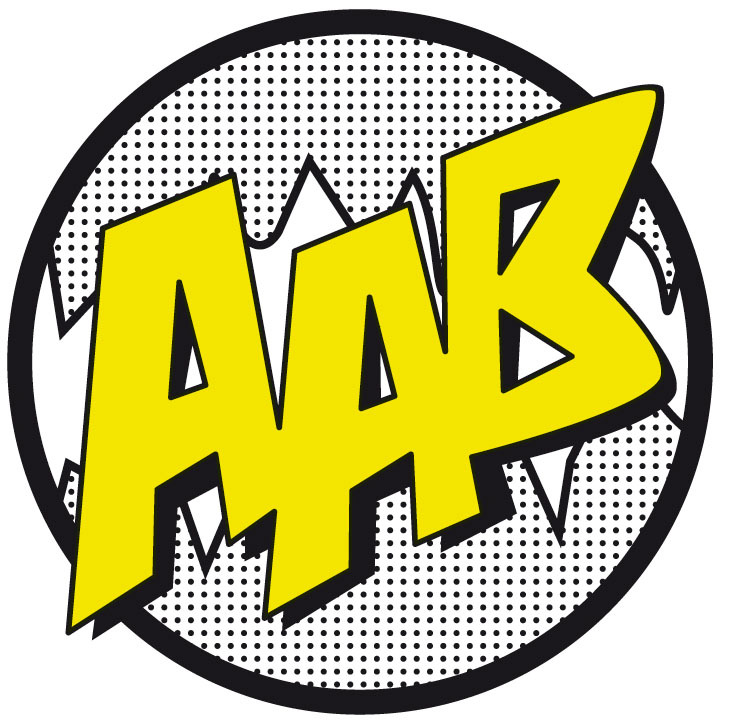 Check for gallery shop opening times. Check UCCASTORE for online sales.